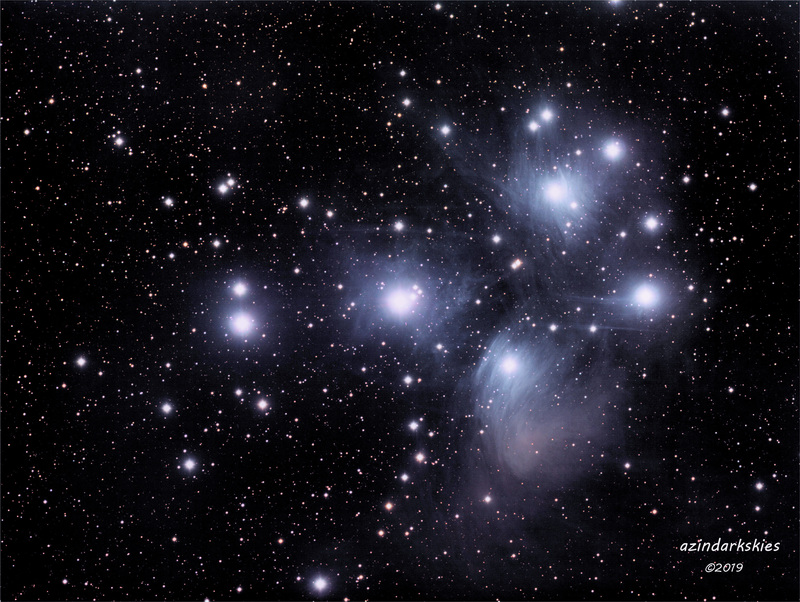 M45 - The Pleiades (The Seven Sisters) | Welcome to AzInDarkskies! Pleiades, Messier 45, is an open cluster of stars in the constellation of the Bull(Taurus). It is approximately 430 light years from our solar system. It contains a large amount of bright nebulosity material and more than 300 stars, of which six or seven can be seen by the unaided eye. It was formerly thought that the dust was left over from the formation of the cluster, but at the age of about 100 million years, almost all the dust originally present would have been dispersed by radiation pressure. Instead, it seems that the cluster is simply passing through a particularly dusty region of the interstellar medium. In both myth and science, the Pleiades are considered to be sibling stars. Modern astronomers say the Pleiades stars were born from the same cloud of gas and dust some 100 million years ago. This gravitationally bound cluster of several hundred stars looms some 430 light years distant, and these sibling stars drift through space together at about 25 miles per second. Many of these Pleiades stars shine hundreds of times more brightly than our sun.